Many District customers, especially those who have just moved to the area, have questions about what makes up the cost of their bi-monthly bill. Below is some basic information about factors that influence the rates in our unique District. The District’s utility bills are for services received in the previous two months and are mailed out bi-monthly. All water service in the District is metered. Water use from 0-600 cubic feet per billing period is covered by the basic rate; water usage over 600 cubic feet is billed at an additional charge. The average water use over the duration of two months for a family of two persons is 900-1000 cubic feet. Water usage usually increases during the summer months. Sewer is billed at a flat rate. 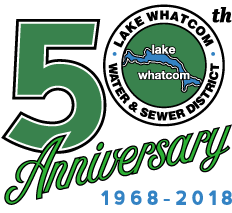 If you are a Lake Whatcom Water and Sewer District customer, you are living in an environmentally sensitive and difficult to serve area. The District has a relatively small, mostly residential customer base; currently about 4,000 customers. Our rates are based on cost of service. Other than the occasional grant or low-cost loan for specific infrastructure projects, the District receives no outside funding. All costs are borne by our customers. The mostly forested, steep slopes of the District’s service area require extensive infrastructure. The bowl-shaped topography of our service area means more pumps are required, both to deliver water to our customers’ homes and for pumping and transporting sewage out of the watershed. The District owns, maintains, and operates 28 sewer pump stations, more than are necessary for the entire City of Bellingham. The entirety of the Lake Whatcom Water and Sewer District is located within the boundaries of the Lake Whatcom Watershed. Serving customers in the watershed presents some unique challenges to the District, including the inability to treat or process our customer’s sewage. All wastewater must be transported to the City of Bellingham’s wastewater treatment plant located at Post Point in the Fairhaven area. In addition to the infrastructure required, District customers must also pay their fair share of the City of Bellingham’s costs for processing their sewage. The City of Bellingham’s sewage treatment bill accounts for roughly 1/4 of the District’s annual operating budget. Sewer disposal costs and a share of the City’s facility upgrades and maintenance costs to the District are based upon the volume of sewage that is sent to the wastewater treatment plant. Much of the District’s sewer system was originally installed in the early to mid-1970s. Infrastructure such as pump stations and transmission lines wear out over time and must be refurbished, repaired, or replaced as needed. Engineers estimate that sewer pump stations have an effective life of around 30 years. The District also owns, operates, and maintains over 71 miles of water transmission and distribution lines, and over 75 miles of sewage collection and conveyance lines. Depending upon different factors such as the types of material that the pipes are made of, engineers estimate that sewer transmission lines have an effective life of roughly 100 years. Transmission lines are also vulnerable to breakage and plugging from causes other than normal wear and tear. The Board must think ahead & be prepared for upgrades, repairs, replacements, and emergencies. Setting utility rates is a complex issue. In setting the rates, the District’s Board of Commissioners must ensure money is budgeted to pay for the day to day operations of the District, as well as to cover future infrastructure upgrades, repairs, and replacements. Because rate setting is such a complex issue, the District has periodic rate studies performed by a rate consultant. General inflation is estimated at 3% per year. Labor Cost inflation is estimated at 4% per year. Employee benefit cost inflation is estimated at 6% per year. General construction costs are inflated at 4% per year. A system replacement (depreciation) funding policy is currently in place to fund annually from rates an amount equal to annual depreciation expenses. Please visit our billing rates page for more information about current rates.